Thank you Burlap Fabric for providing my supplies. All opinions are 100% my own. This project was made with burlap ribbon from BurlapFabric.com. They have so much burlap fabric, ribbon and more. I really loved working with this burlap ribbon. It is probably the best quality burlap ribbon I’ve ever used. It doesn’t shred or fall apart, and I love that it comes in gorgeous colors. Years ago I saw this lovely pumpkin wall hanging made of swirls of mesh ribbon. I think it’s been going around Pinterest for years. One of my neighbors even made that pumpkin. I thought it was gorgeous, but it inspired me to use burlap ribbon and make my own version as a Christmas Tree. 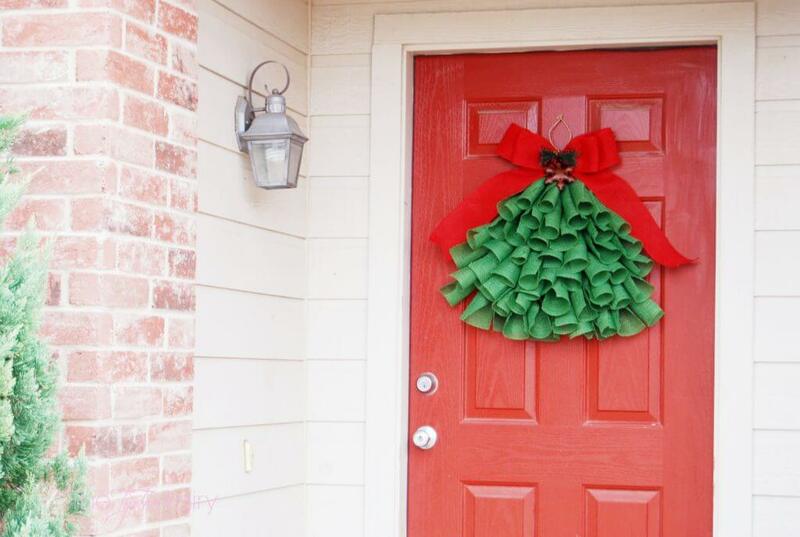 I thought it would be lovely to hang on the front door instead of a typical Christmas wreath. I love the homespun look that burlap gives. 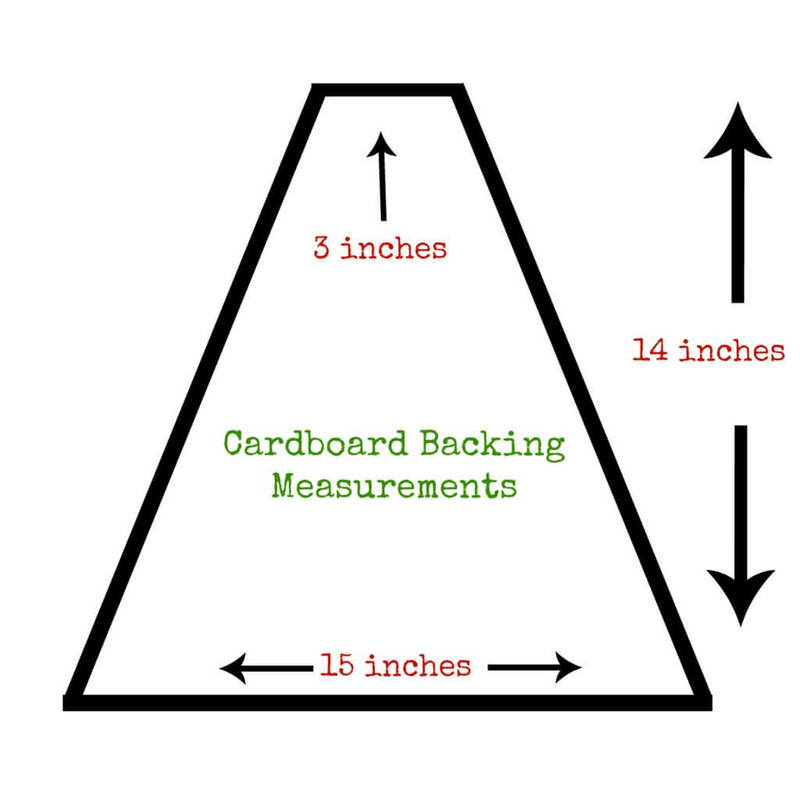 This is the measurements I cut my original cardboard backing, which I just got from ripping up a box. This was the perfect size because it used up nearly the entire roll of green burlap ribbon. The finished measurements for my tree are about 24 x 25 inches. This is a great project that takes less than a couple hours to complete. You can watch a Christmas movie and drink hot chocolate as you work. 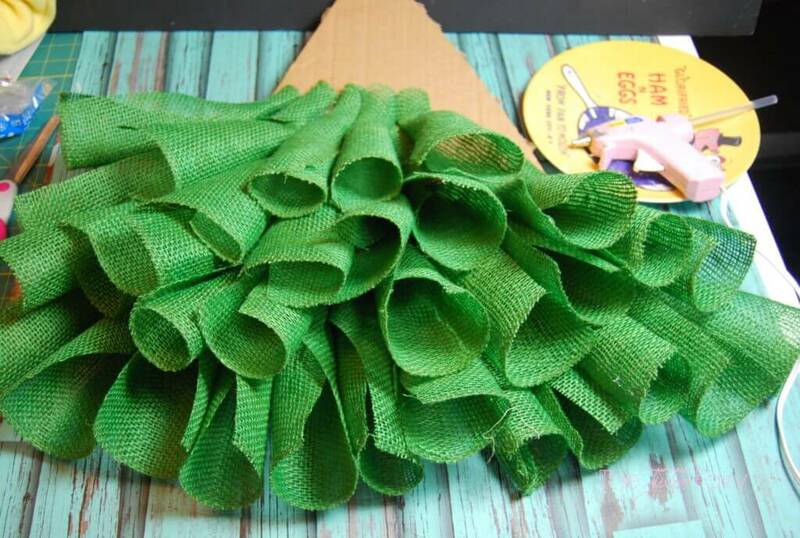 Once the cardboard triangle is cut, you’ll cut 6 inch pieces of the green burlap ribbon. I used my rotary cutter and mat and cut about 10-15 at a time as I worked. 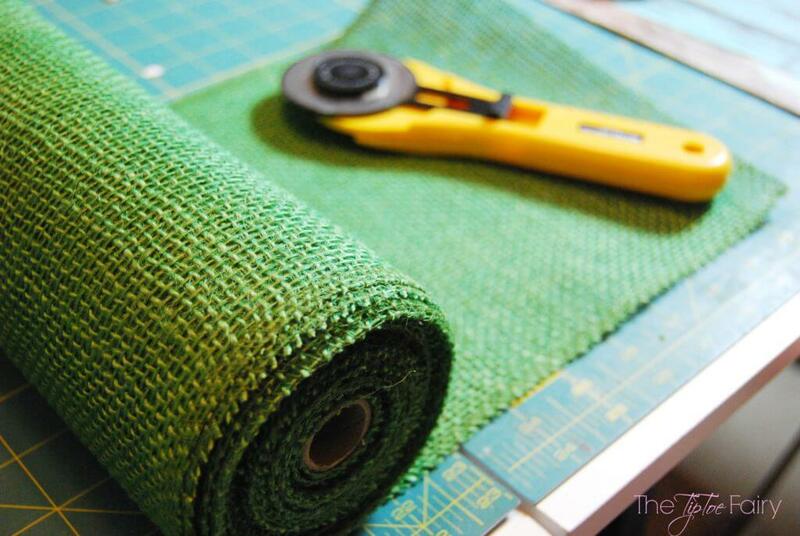 Take a 6-inch piece of burlap, roll it up, and glue just one end of the roll together. Then, add another squirt of glue and place it on the cardboard. I recommend starting at the bottom of the triangle and working your way up. In the tutorial below, you can see I started in the middle because I had no idea what I was doing. But, after placing those three in the middle, I began working from the bottom up, so that each layer’s raw edges were covered by the next upper layer. I was so excited as I added more and more rolls of burlap ribbon and could see how the tree was taking shape. It was exactly like I pictured in my head! Don’t you love it when a project comes out that way? To finish off the tree, I added a red burlap bow and coordinating homespun ornament I found at a local craft store, for 50% off! 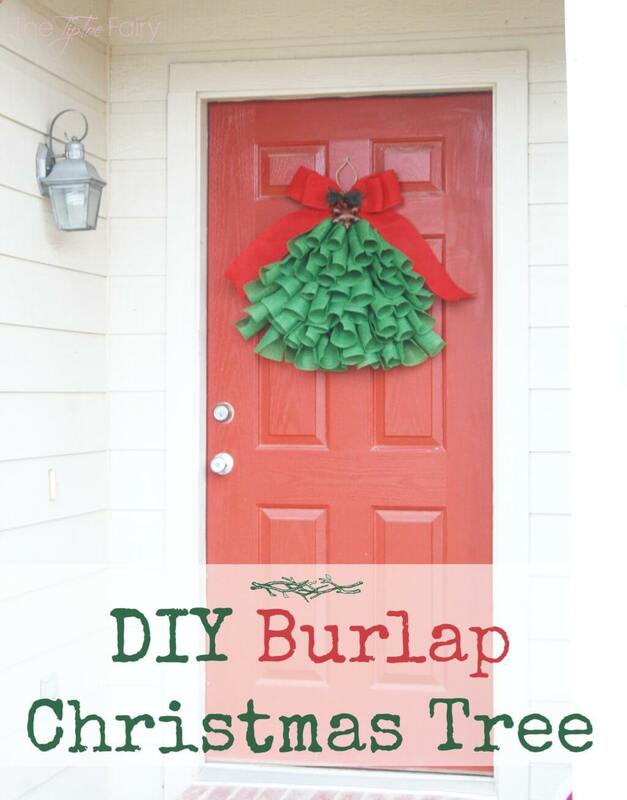 Make sure to head over to BurlapFabric.com’s Facebook, Twitter, and Pinterest pages to see other gorgeous ideas to decorate your home. 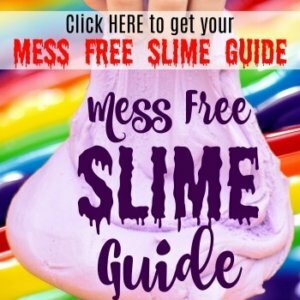 For video tutorials, head to their YouTube channel. This is SO darling! i love that ive never seen anything like it, way to go! 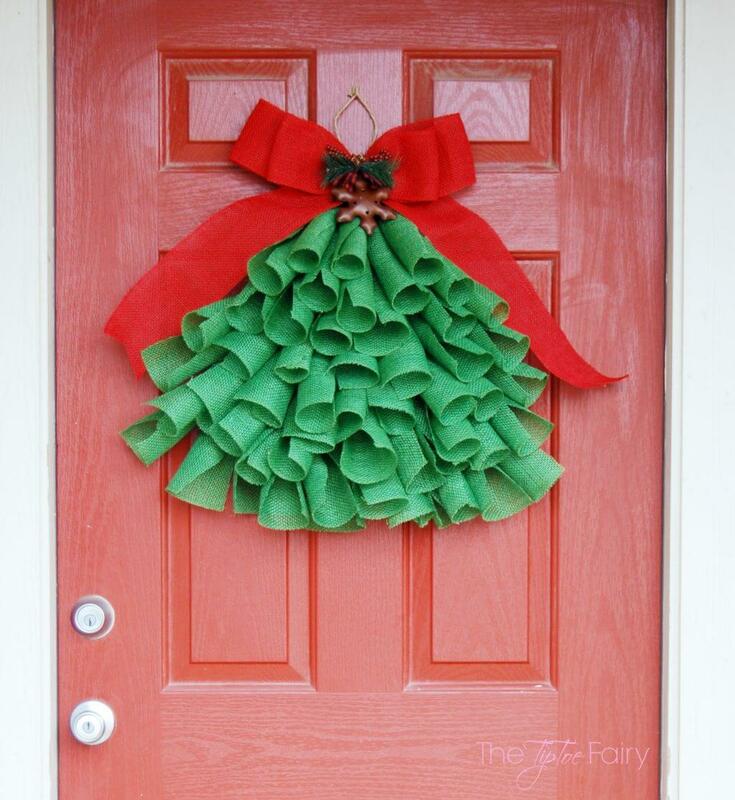 What a beautiful idea, it looks so nice hanging at the front door! I love this Christmas and this looks super easy to make. Thank you for sharing. This is an awesome idea and it looks really cute. Very creative and I will have to try this. Thanks for sharing. This looks really cute on the door. 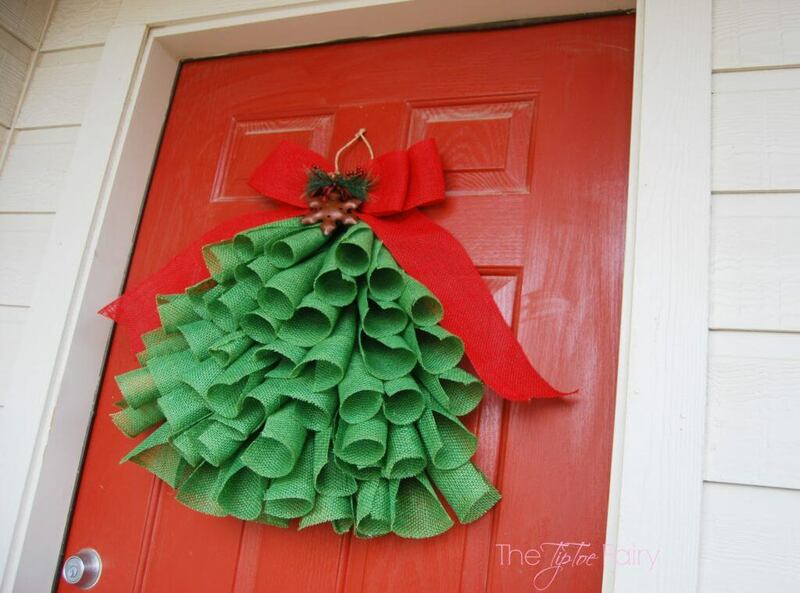 I love the look of this wreath, so creative. This turned out great! So much better than a wreath. I should make this for my mother-in-law. She would love it! Hi Stephanie, i wholeheartedly agree with the other readers. I was looking for something different and creative for my front door and this is it ! Of course it really helps that your front door is red, mine is white and there’s no chance my hubby could be talked into painting it so i must come up with a different color combo. Maybe a red tree with a green bow or green tree with a white bow or maybe a green tree with a red bow and a few dollops og white paint at the tips of the green branches ! Oh heck, why mess with perfection, haha ! Happy holidays and thanks for sharing.